Nike announced another quarter with stronger-than-expected sales and earnings, but pressures in other areas are still giving Wall Street pause. Here's are five points to look at now. Nike (NYSE:NKE) announced fiscal-year Q2 earnings on Tuesday, and even though the company beat both sales and earnings estimates, the stock barely moved. There's a lot to sift through in this earnings release, including hints about upcoming products and segment moves, new regional shifts, and the company's expectations for the second half of the year. Here are some important highlights from the earnings. Nike posted sales up 6% year over year, but 8% adjusted for changes in currency (because the dollar has appreciated). Earnings for the quarter at $0.50 per share were up 11% thanks to lower costs and share repurchases. Both numbers were above analyst expectations, and even if Nike isn't blowing it out of the water on those metrics, it's growing steadily. China has been a growth story for a lot of the sportswear brands for some time. Rising middle-class populations in China that are more and more concerned with sports and fitness bodes well for Nike and its competitors like Under Armour (NYSE:UAA)(NYSE:UA). Both companies are working to win over this market with specific e-commerce plays and country tours by internationally recognized sponsored athletes. China continues to be a growth driver for Nike, with sales adjusted for currency changes up 17% year over year in the quarter. Nike's new Jordan Bastille store in Paris. Image source: Nike. Another segment that's starting to stand out is Western Europe. Because of economic and regional pressures along with Adidas' (NASDAQOTH:ADDYY) recent competitive bump and its home-court advantage, Europe hasn't necessarily been a projected growth center for Nike. Still, Nike got it done this quarter with 12% sales growth year over year and announcements about new flagship stores opening in cities like Paris. Direct-to-consumer (DTC) sales, which include Nike stores and Nike.com, have been a major growth driver for the company. For Nike.com, specifically, sales worldwide grew 46% year over year. Notably, Nike has increased its number of country-specific sites from 20 to 40 in recent quarters, helping to increase e-commerce sales across the world. While the three points above look solid, here's the bad news -- Nike's gross margin continues to slip, and this time, it fell all the way to 44.2%, its lowest point in nearly three years. The decline comes from a higher percentage of discounted sales, as well as higher-priced goods. Nike management's response, as it has been in the last few quarters, was, "We're working on it." 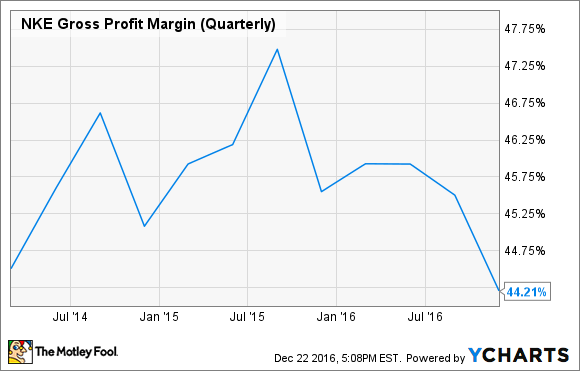 NKE Gross Profit Margin (Quarterly) data by YCharts. You won't be able to -- because the company didn't disclose in FY Q1 what the "one time tax benefit" was that allowed the company to pay just 2.5% effective tax compared to the approximately 20% paid for the prior fiscal year. Regardless, this quarter, the company paid 24.4% tax. The good news is that you can't attribute the earnings beat just to a tax benefit. Instead, credit goes to more efficient operations, such as the 3% decrease in operating overhead expense. Nike's new HyperAdapt self-lacing shoes. Image source: Nike. Nike stock: Room to run? Nike beat estimates on both sales and earnings, so why didn't the stock pop? Wall Street seems to be concerned with Nike's margin woes, as well as concerns that the sales growth will stop. It's also worth noting that Nike's valuation still isn't especially cheap. Trading at 23 times earnings, it's one of the cheaper companies among its competitors, far cheaper than Under Armour at around 69 times earnings, but still more expensive than the market average, while also being the worst performing stock of the Dow so far this year. Still, going forward, Nike continues to look like a great play. The company's aggressive moves to stay competitive, smart international growth, focus on DTC and Nike.com sales, and moonshot projects like the recently launched Hyperadapt $720 self-tying shoes, could help the company's sales growth continue as it pushes toward $50 billion in sales by FY 2020 (currently estimated to reach $34.7 billion this year). Nike is probably not going to blow any upcoming quarter out of the water in terms of growth, but it will likely continue to solidly perform on its top and bottom line. Once it can figure out gross margins, the market is likely to reward it more.